I'm pretty sure the bolts on Grack Marginal are 3/8" now. but in 2009 Roger Brown and I fixed ropes in that area and replaced all the bolts on all reachable climbs that had not already been upgraded to 3/8". It was probably one of the first climbs to have its bolts replaced, probably before ASCA existed. I have done the climb a few times and don't recall any 1/4". There are a couple of smooth moves just over the small roof at the start that are the crux. One of my favorite routes!!!!! : D Did it last and this spring so we could swap pitches to make a complete-lead. : ) Got to lead P1 last time and P2+3 this year. (Note: we started from the tree.) Absolutely loved it. I always remember that particular moment when I was on the sharp end on P1 after going over the roof, reaching for the second bolt, the next, and next... smiling the entire way up to the anchor : D The excitement, and the psyche... Like a picture that will never fade. It was a beautiful day, a beautiful & super fun climb. A green (or... whether a purple or red - guess I'll have to go back and find that out to confirm since I cannot remember which it was : p ) before getting to the roof after traversing over from the tree and a red X4 to back up the 2nd piton on the third pitch is the gear needed on this route (and the few draws : ) Most of all, a relaxed and happy mind!!!!!!!! It sounds like you were, indeed on (or at least near) the Right Side route. A story Vern Clevenger and Dale Bard both told me (separately) in the early 1970's, where Dale got lost and ended up doing, essentially, a 150-foot lead with no pro always deterred me from the Right Side. The last pitch of Marginal is rather runout, too, though I doubt that it deters nearly as many as the moves over the roof between the first and second bolts. I first did this route in 1972 in RR's, and that section was exciting for both follower and leader. Modern shoes help a lot now, but I still wouldn't pick this as my first 5.9 Apron lead. Although I've fallen over the roof and had only a bruised ego to show for it, one of my friends did the same thing a couple of weeks later and broke his ankle. That said, Marginal is a beautiful route, and I'm sure I'll repeat it several times more before I'm done. Just did, or tried to do Marginal, (5.9R at Glacier Point Apron) yesterday, but got suckered off route to a bolted belay about 20-30' right of the last bolt on pitch two, right before the 5.9R section. From that bolt, you can't see the bolted anchor above, and I thought I had just gone up and left to an off route bolt or something and had almost passed my anchors. That was definitely an incorrect chain of thoughts, and I should have continued straight up, like to topo says. Just thought it might be a good addition to mark the bolted, off route belay on the topo. Also, if anyone happens to have any information on what is over that way, from that bolted belay, we continued up and right, clipping a bolt, then continuing up a shallow (two inch) right facing dihedral to another two bolts, then trending up and right from there to a ledge with a bush and bolted anchor. (This may be the ledge deemed Good Friday, not sure.) After this, we went up and left to a bolt below another shallow (4 inches?) right facing dihedral, up that passing two fixed copper heads, then to a bolt above. From that bolt, I trended up and left on VERY slick climbing following a super thin seam that had another fixed head maybe 35 feet above the last bolt. This climbing was at least 5.10. From that fixed head, there was another bolt about 10-15 feet above it, and then a few more moves lead to the easy ledge and dihedral system right of the anchors atop of The Grack. On the rappel, we realized how truly off route we were, and toproped the second half of the second pitch of Marginal proper to get a comparison for what 5.9 should feel like. Let's just say it felt WAY easier than what we did, and way less scary. Like I mentioned, if anyone has any insight as to what that might have been, that'd be great. We're curious what the heck we climbed. Prelude to Insanity, I've done this route many times, the first in 1972 but the most noteable was in mid summer 1974 with John Yablonsky.We had decided to ransack the fixed gear always left by the gripped climbing clubbers on Monday Morning Slab and the Grack as John was committed in days to attempt the Firefall Face with Meade Hargis and wanting to get a better look from underneath too.Someone previously bailed at the bolts above the small "roof" high on the first pitch leaving new slings and carabiners and John was drawn to them like a moth to a flame. He took off in beat up EB's you could see his toes hanging out and free soloed the entire route ending up on top displaying his looted gear like a gold medal and then came sailing down the Grack on someone's rope. I'd seen him solo things but never a grade like this before. A true look into the future. 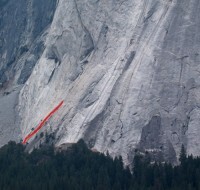 I did this climb with Jack Holmgren in June of 1994. We started late and the sun was well gone when we finished. I had a bad right knee and remember thinking that it was pretty dumb for me to be out there on friction always using my left foot to step up. There were a couple of fixed pins, marginal (no pun intended) then, likely gone now. Did this climb in 1981 with Anne Carrier; she was wanting to try a hard friction lead. She bopped right up it in RR Varappes. Never saw a mountain lion; we did see a large bobcat several times that trip. He must live there scarfing up the marmots. This is a climb for a late afternoon start. Takes only a short walk to get there. Tried this route in 1975 in EB,s with my climbing buddy Dave Steres (anybody know him?...would like to get in touch...he lived in Riverside) anyways Dave was in Robbins boots and found the edging/friction too scary. We somehow backed off. Finally did the route in 1990 on a brief visit and just before dark (glad I didn't know about the Mountain Lion but hey it probably hadn't been born!)..... , absolutely brilliant climbing! a must do route for anyone .........also remember placing gear, a rock and a small cam. great route, heads up. pass the doubled up bolt, i clipped it and leaned back to see the real anchor 30 ft away, boo. I also slid at the crux, probably 5-8 feet down into the 5.8 terrain. Still looking down at my bolt and knowing my belayer had no clue what was going on i tennatively cleaned off the balled up rubber (5.10)and kept moving up as fast as I could. also, the fixed angle on p3 looks like it has seen much better times. It can be backed up with a good small cam... maybe the pin should be retired? We had the stinkin' marmots in our packs too. As we rapped off we had the privilege to watch a mountain lion catch one of those fat marmots. The really spooky thing was that the cat walked right down the access trail and we weren't convinced that a power-bar-fed marmot was filling enough for the lion. The Atlantic of Friction- Very zen like mind is required to cruise this. Yeah that one nut placement is questionable. I remember not getting in but one piece on that last pitch and quite a bit of 5.9 climbing, but memory isn't what it used to be. Climbed this on 6/5/03. I was returning to climbing after a 20 year layoff (did this climb back in the 70's). We finished After Six over on Maunure Pile and felt like testing my oats. This was a tough committed lead. I felt the runouts were more like 30 feet on the first pitch. It was mostly just friction with very few fingernail sized flakes. I found it tested my confidence level at every bolt on the first pitch. I managed to get a BD #4 stopper behind a flake on the first pitch to cut the runout in half (didn't test to see how much of a fall it would hold). I wouldn't suggest this as your first 5.9 lead unless you are real comfortable with friction climbing and long runouts. The worst part was watching some squirels tear a hole in my pack getting my lunch from 200 feet up and not being able to do anything about it.